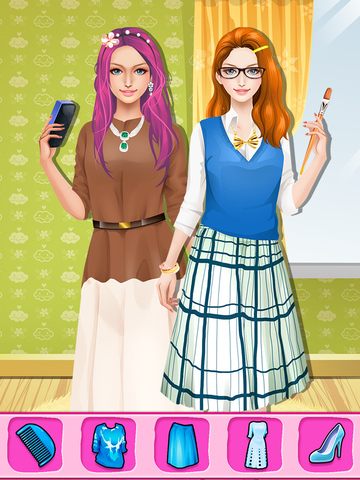 Fashion Doll Salon - Teacher Dress Up for School! School teachers like to dress in stylish clothes, too, you know! Fashion Doll Salon gives you your very own beauty salon and lets you dress up teachers in amazing new clothes, shoes, skirts and much more! The work holiday is coming up, but for now class is still in session. Can you pick out the best clothes and shoes to turn the teacher into a classroom beauty? Pick your favorite teacher and let the beauty makeover begin. Start with a good work style, something businesslike that still looks good. Go through your salon wardrobe and pick out new clothes, shoes, holiday hats, dresses and skirts for the teacher to wear to class. Any style will work, just as long as she looks like a beauty queen when you're done! Don't forget the hairstyle and makeup, two of the most important things when it comes to a girl's beauty! Pick out the hottest hairstyles and the cutest makeup colors for teacher to wear to work. Dress her up so when the holiday arrives, she'll be ready to go out and have a good time! Class is dismissed. Go pick out some new clothes and shoes so the teacher can leave work and enjoy the holiday! - Dress up school teachers to look like beauty queens. - Choose different hairstyles, makeup and fashions. - Create stylish clothes from many different dresses, skirts and tops. - Features different jewelry, shoes and accessories, too! - Pick out a hairstyle and put makeup on the teacher. 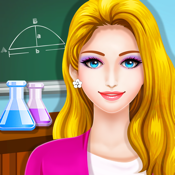 - Use the touch screen to choose a teacher to give a makeover to. - Dress up each girl by choosing dresses, shoes, clothes and outfits. - Apply makeup and pick out a beautiful hairstyle!